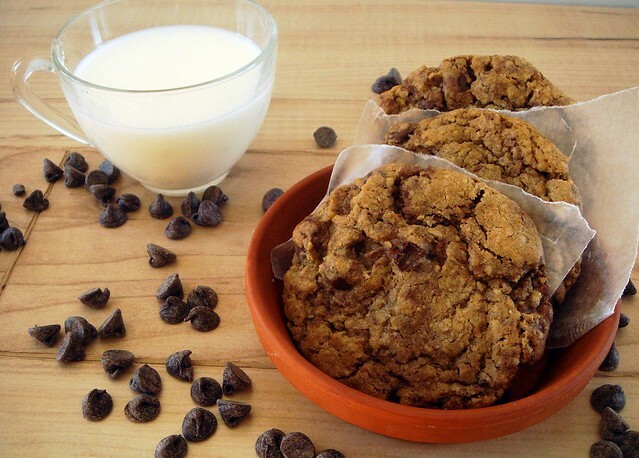 There are a million and one ways to make a chocolate chip cookie. You've either tried them all and are still looking, or you've found a recipe you like so much that you quit looking. I'm in the middle of the two, and when a customer of my dad's gave him a recipe for chocolate chips cookies along with a sample (a long time ago), I knew I needed to try this other version. You have probably heard of it before. 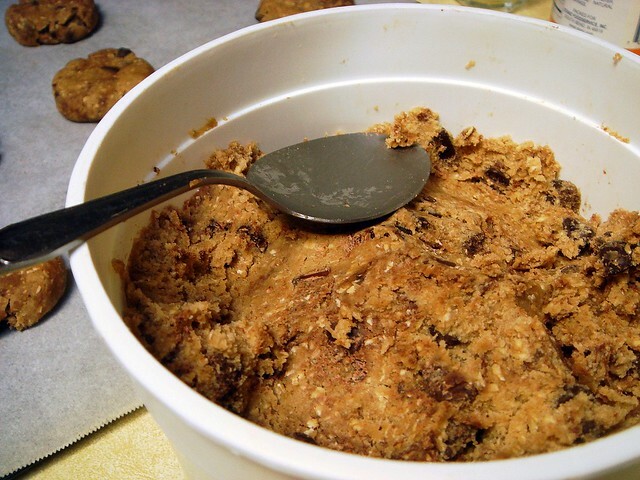 The version I made is called Lazarus Chocolate Chunk Cookies, also known as the Neiman-Marcus cookie. 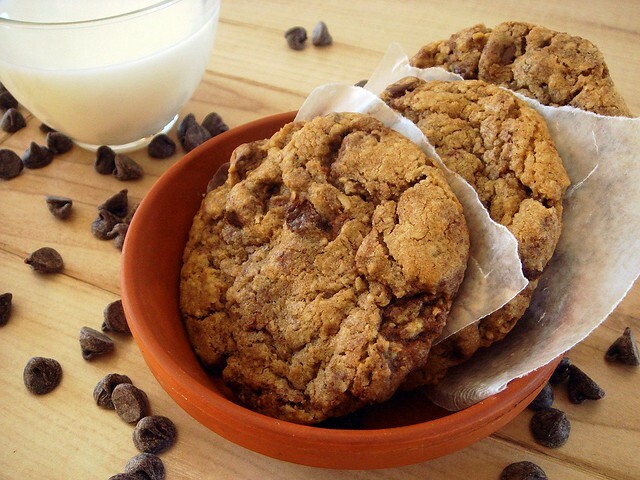 What makes it different from other recipes is the addition of oat flour which gives the cookie complexity without changing the texture too much. Along with chocolate chunks (or chips), melted chocolate gets swirled into the dough. I added a tablespoon of instant espresso powder to the dough, and I suggest you do the same. You could also sprinkle the tops with coarse salt and sub some of the all-purpose flour for bread flour, a la the NYT chocolate chip cookie. Perhaps in place of instant espresso powder you could add freshly ground coffee to the dough like I did in for the NYT cookies. Possibilities are endless. I'm constantly merging recipes to find my ultimate recipe, so I play around a lot. The oat flour is what does it for me. I was so impressed by the flavor and chewy texture back when I first tried this recipe that I started experimenting with oat flour in other recipes, like a biscotti recipe I need to blog about, and my recently posted oatmeal scones. Because of the chips and melted chocolate, this cookies packs an intense chocolatey punch. Next time, I'd use more brown sugar than white because I like a deeper molasses-like flavor in the dough portion. So, even if you have already found your favorite go-to chocolate chip cookie recipe, I urge you to give this recipe a try. It may not replace your favorite recipe, but it will give you another option for when you want a cookie with a little more substance. Preheat oven to 375°; line a baking sheet with parchment paper and set aside. In a medium bowl, whisk together flour, oat flour, salt, baking powder, and baking soda. In a large bowl, beat butter with both sugars until light and fluffy, about 2-3 minutes. Add eggs, one at a time, and beat until combined. Add espresso powder and vanilla and mix just until combined. Using a large wooden spoon or spatula, stir in the flour mixture until a few streaks of flour remain. Add the chocolate chips and melted chocolate, stirring until chips are mixed throughout dough. Chill in refrigerator for 30-60 minutes. Portion out 1-2 tablespoon portions onto prepared baking sheet, leaving about 1-2 inches of space in between dough balls. Press down with palm of your hand until the cookies form 1/2-inch thick disks. Bake for 10-13 minutes, or until tops of cookies are just set and edges have browned slightly. Let cool on baking sheet for 10 minute, then remove to a wire rack to cool completely. Look at all the chocolate chips you dropped on the counter. Do you always make a mess like that when you're cooking? These cookies look so delicious, Christina! What a fun recipe with a yummy result. Thanks for sharing. These look amazing. A good chocolate chip cookie is pure heaven. 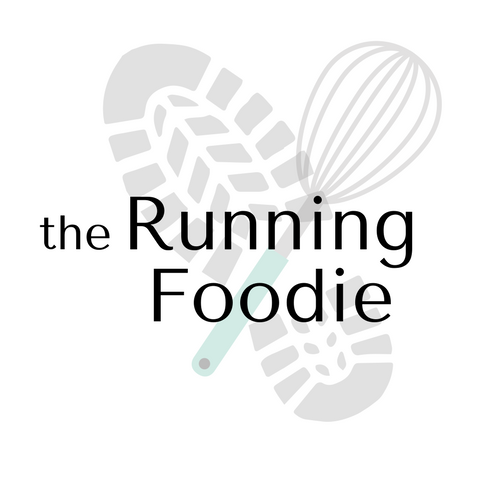 I'm a kitchen klutz, Jogger. Thanks, Georgia! Always glad to share. It really is, Matt. I'll leave it at that because I could talk about this for a while. I'm hard-pressed to unseed my hallmark ccc recipe, but I will secretly make this one. Don't tell my other ones, OK? Thanks for this recipe! !